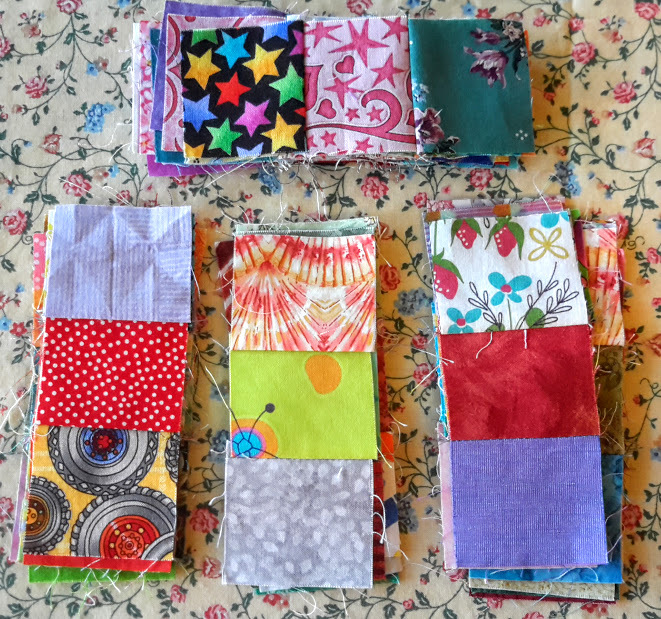 I’m at the stage in the Calico Rose quilt where I’m making components in order to make blocks. 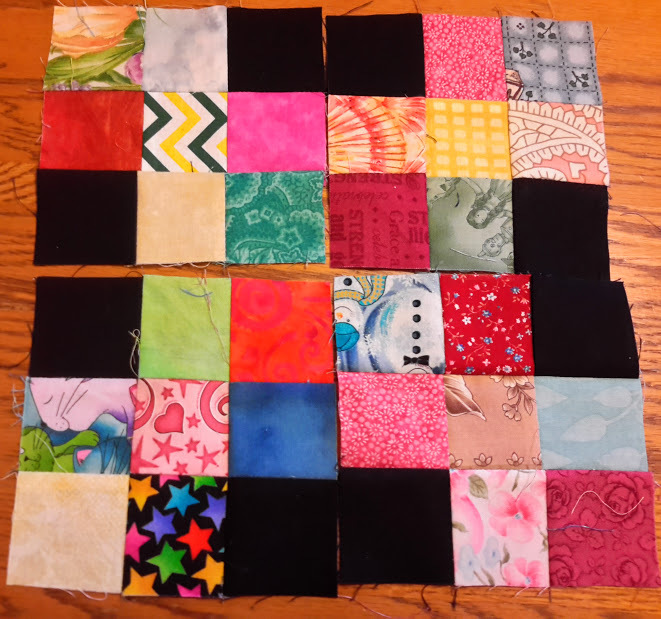 There are 49 blocks in this quilt, all of which have multiple pieces. And by that I don’t mean 1 or 2 pieces. The blocks I’m making below are components of the 49 blocks that need to be made. Happily I’ve made all the four patch blocks I need! Yay!! 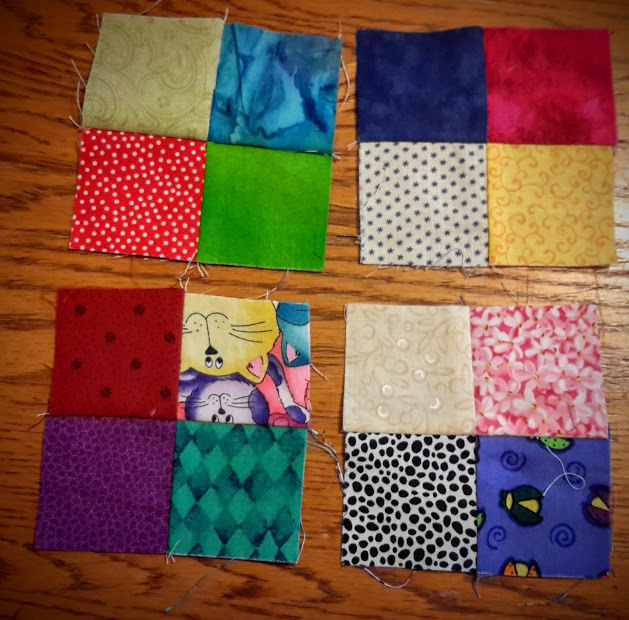 Three patches are being sewn that will become part of nine patch blocks. I need to make 96 nine patch blocks, and that’s going to take me a while. I haven’t counted how many pieces are in this quilt but I think I better not or I’ll feel intimidated! It’s summer time and camping and other outdoor activities with friends come before sewing time, however tonight I have some time to devote to this and some (small) progress is being made. Every little step gets you closer to your destination. Keep up the good work! Thank you Bonnie. I’m getting there. Slowly but surely wins the race, right? That’s a lot of patches! Is this a Bonnie Hunter pattern. Will be colorful. Thanks for linking to WIPs Be Gone. It is a lot of patches. This one isn’t a Bonnie Hunter Pattern though it looks like it would qualify. This quilt was on the WeddingDressBlue blog. She has lots of fun scrappy quilts there! I’m a bit of masochist – I made the Film at 5 Quilt with 2″ squares..